It seems like every few posts I write here, I end up apologizing for how long it’s been since my last post. This time, the lapse is starting to feel egregious. It started because of ensuing life changes. Between our cross country move and my new job in the past year, maybe waiting to add another big thing to the mix would have been wise; but I’m impatient at heart and waiting is overrated. Within a few weeks, I was too queasy to bake. The thought of sugar turned my stomach; creaming it with butter, measuring out flour, and preparing baking pans for the oven seemed an insurmountable, exhausting task. My coworkers asked why the cookie supply had dwindled, but all I had was a shrug and weak smile in response. I let Easter, Memorial day, 4th of July, and even national doughnut day go by in silence. No post-ham dessert, no blueberry cobbler, not a single recipe (though the excuse to make doughnuts was sorely passed up). A few weekends ago Mr. R and I drove out west on Rt 2 with friends we hadn’t seen in too long. Our destination was a pastoral family farm in the fertile Pioneer Valley. Once the bottom of a glacial lake fed by the Connecticut River, this valley is now some of the best farmland in Massachusetts. 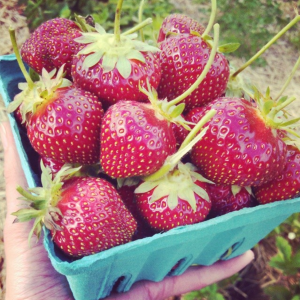 The farm was celebrating the strawberry harvest with an all day event of tastings, music, and picking capped off with a festive strawberry themed dinner by the barn. As we stared down the long rows of strawberries, deciding which variety to start picking*, I was filled with that adrenaline fueled sense of relief and gratitude that comes when you avert a close call. I had almost let spring pass me by! I had lost that connection to the local growing season that my weekly trips to the Madison farmer’s market kept acutely tuned. I knew that asparagus had come and gone in the grocery stores, that berries were in good supply, and that summer crops like nectarines, peaches, and corn were filtering in; but I had forgotten the satisfaction and pleasure that comes from getting the things that taste good now, the foods that are ripe now, directly from the people working hard to grow them. Phew…that was a close one! Mr. R and I restrained ourselves to picking just 2 quarts of berries that afternoon. 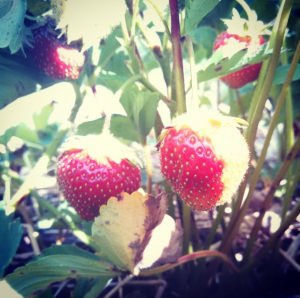 They were the kind of berries so ripe, sunwarmed, and fresh they would need to be eaten or transformed within 24 hours. So while we ate some macerated with a little vanilla sugar and balsamic vinegar the next morning on our pancakes, I was then faced with the daunting decision of what to do with the rest before the end of the day. 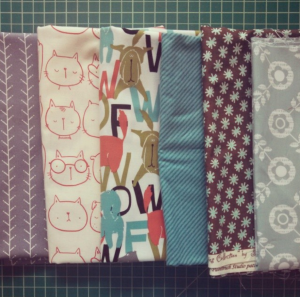 …Three days later after some distractingly cute fabric I purchased on Saturday was safely transformed into a new quilt top, I actually got around to doing something about those thankfully-not-yet-mushy-but-totally-on-the-verge strawberries. As part of the appetizer course of our dinner at the farm, the chef made a delicious strawberry condiment. I mistook it for a jam as it was mostly sweet; but studded with mustard seeds and packed with whole, plump strawberries that weren’t cooked into typical jammy obliteration, it was clearly not quite the right classification. Enough guests asked about it that evening, that the chef informed us it was a typical Italian mostarda: basically any fruit (soft varieties work best) left to stand with sugar to release the juices which are then strained off and cooked down. Repeat this process anywhere from one to three days, then give the fruit a final gentle cooking in the reduced liquid, add in some mustard powder, seeds, and vinegar, chill, and serve alongside a good chewy loaf of bread and cheese. Yum. 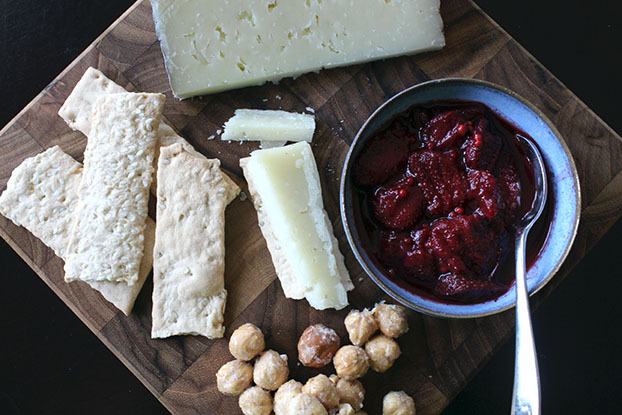 I wanted a bit more kick to my mostarda than the one we had that evening, so the recipe below is an amalgamation of that recipe as well as an article on Food52 with a few of my own additions to kick it all up a notch. 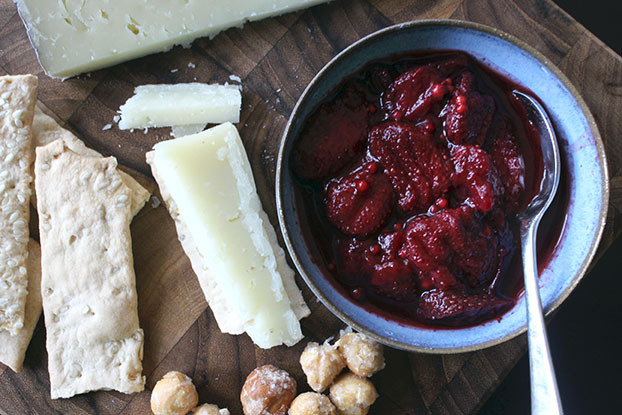 Now safely savory enough not to be mistaken for a jam, this recipe will compliment a cheese and cracker plate perfectly with a refreshing summer wine. Day 1: Rinse and stem your strawberries, cutting large berries in half. 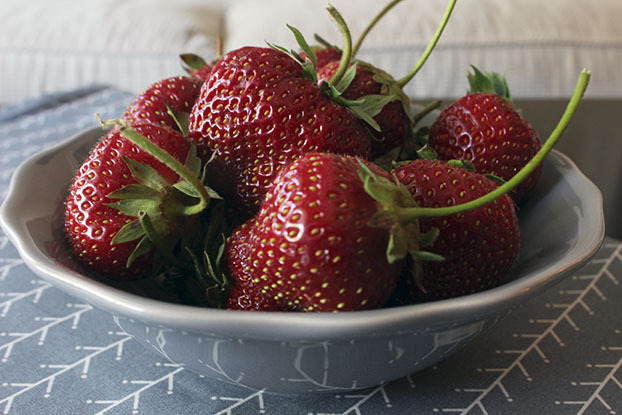 Place berries in a large bowl and toss gently with the sugar and salt to coat. Simmer the dried strawberries and ginger in the wine for 10-15 minutes until softened and most of the wine has been absorbed. Mix the dried fruits into the strawberries, cover everything tightly with plastic wrap, place in the fridge and walk away. Day 2: Strain the juices away from the berries and place in a sauce pot. Simmer the juices until they become thick, syrupy, and sticky. Pour the reduced liquid back onto the strawberries, toss to coat, cover with plastic and return to the fridge for 8 hours or overnight. > 8 hrs later: Strain the juices away from the strawberries again and simmer in a wide, shallow pan until reduced, thick, and syrupy. (Don’t be shy here, the strawberries will release more liquid when you add them to the pot. If your syrup isn’t heavily reduced it will end up too runny at the end.) While you’re waiting, mix the mustard powder and seeds into the apple cider vinegar. Once the syrup is reduced, add the strawberries and mustard mixture into the pot. Simmer for 5-10 minutes to let the berries soften. 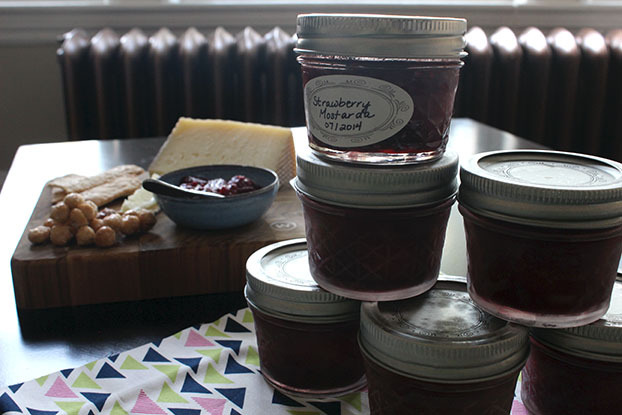 Pour the hot mostarda into sterilized jars and seal with new lids. As the mostarda cools, a vacuum will form and cause the lids to seal. Store in the fridge for 1 week or the freezer for longer. * I didn’t realize there were as many varieties of strawberries as there are of apples! I knew of the tiny, wild ones prized in France and the big, uniform ones shipped out from California. I knew of the ones my grandfather grew on his farm until the awful year he tilled the whole bed under and didn’t replant, but I didn’t know of Sweet Charlies and Sonatas, Brunswicks and Jewels, Sparkles and Donnas! Turns out that beyond a couple stand out great ones and a couple stand out blah ones, they all pretty much taste like strawberries; but I could definitely sense how some would stand up well in jam while others were best for fresh eating or baking in pies. One Response to "A Close Call and a Strawberry Stash"